There’s no equivalent to “Indian summer” for a winter that lingers into the next season, but mountain resorts in Utah would be using that phrase a lot this year. Spring skiing, usually when the snow pack melts and ski conditions are marginal, is anything but typical in 2018; in fact, it’s quite a phenom. With heaps of powdery snow amounting in several weeks to the total of what the entire winter season produced, Utah’s ski slopes are experiencing peak conditions that promise to continue through at least late spring. 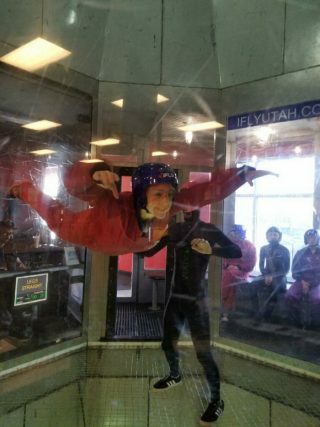 In order to enjoy this wondrous windfall, ushering in a spring break of epic proportions, I headed to the slopes-less-traveled, in Ogden, the best-kept secret of Utah ski country. 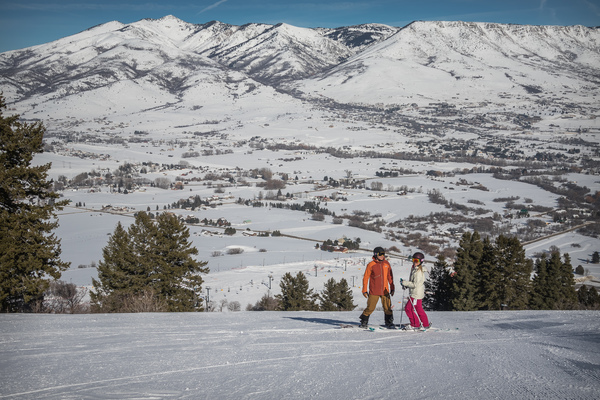 This tiny town 40 miles north of Salt Lake City, at the foot of the Wasatch Mountains, borders a trio of local ski areas that offer everything Park City, Deer Valley, Sundance and their other better-known neighbors do, and they do it in a charming and humble way. 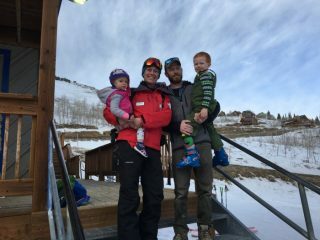 My first stop was Powder Mountain, also known as “Pow Mow,” the apt-named high-altitude playground that owns no snowmaking machines and relies completely on nature’s precipitation. 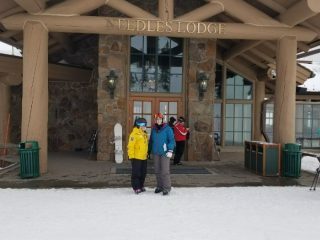 The quaint Sun Down Lodge, with only one ticket window, looks more like a family cabin on the mountainside than a lodge, and the staff there treat you like an old friend. Because Powder Mountain limits lift tickets to 1,500 per day, even on a busy day, there is never a crowd or a long wait at their nine chairlifts. And because fewer skiers and boarders means less stress on the terrain, the runs stay preserved long after a dump of snow. Purists favor Powder Mountain for its dedication to providing a next-to-natural experience, down to its use of CAT snowmobiles to transport skiers and riders to areas of the mountain where chairlifts are inaccessible. 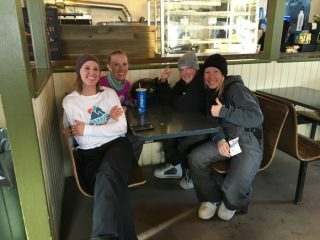 Powder Mountain is the place that many of the locals go, because of its mom-and-pop feel, and it’s known for its family friendly atmosphere, where people are courteous to each other, especially the staff, just like a small town where everyone knows each other. In keeping with their reputation as a family ski destination, Powder Mountain has lots of mellow runs over their approximately 8,500 acres of terrain, with 167 runs with a variety of slopes for learners and skiers and riders of all levels, with 25 percent beginner runs, 40 percent intermediate and 35 percent advanced. For those who enjoy a more extravagant ski vacation experience, the Ogden area offers Snowbasin. 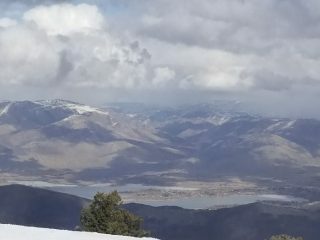 While some of the local mountains are distinguished as ski areas, Snowbasin is unmistakably a resort, and the difference is notable from the moment you drive up. 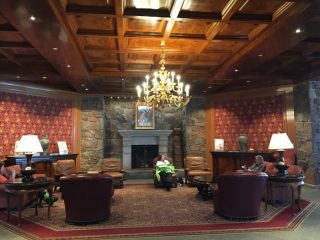 The large luxury Earl’s Lodge resembles an alpine country club, with a flagstone exterior, giant hearths in the entryway, floral wallpaper worthy of a ballroom, and large padded leather chairs under massive chandeliers. 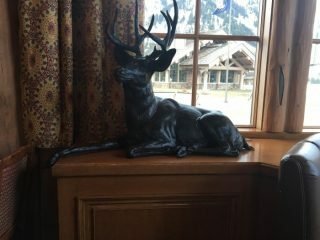 Like its decor, Snowbasin’s service appeals to the luxury-loving crowd, with such amenities as bins for guests to check in their belongings, versus the lockers found at most ski venues. 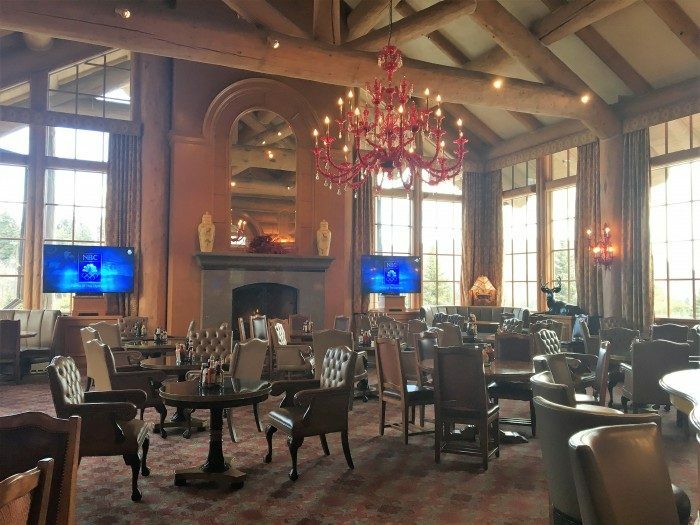 These handy receptacles not only add an element of convenience for visitors, they keep the lounge areas uncluttered with ski jackets, boots and other accoutrement that guests tend to pile up while they are unwinding in the lodge. Another popular amenity that speaks to Snowbasin’s service orientation is their cell phone recharging service, which allows guests to securely leave behind their smartphones to get a quick battery boost, since most guests don’t come equipped with a chargers or spare batteries. 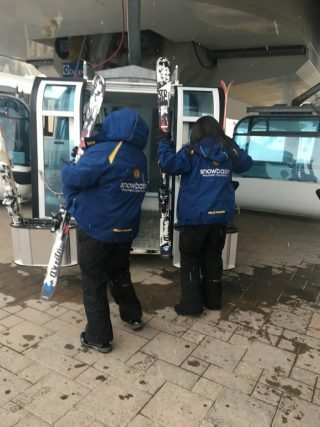 All around, the staff is eager to serve, making everything easier for guests, with full-services touches like loading guest’s’ skis for them on the gondola. Snowbasin is also renowned for its chef-driven culinary excellence. 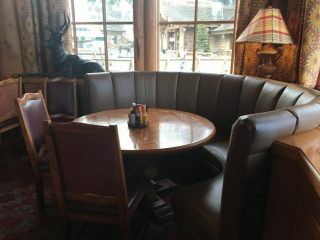 A far cry from the standards of chili, burgers and fries of many ski lodges, the resort features a plethora of restaurant options, and each cafeteria has their own signature gourmet burger. During my visit to the Needles Lodge, 9,000 feet up at the top of the Needles Gondola, I tried the “Bum Burger,” loaded with corned beef, sauerkraut and Russian dressing. The burger was a satisfying meal by itself, but I was persuaded to also try an oversized chocolate chip cookie, made with a family recipe of the resort owners, which was well worth the calories. All the extraordinary service aside, Snowbasin is most famous for its world-class skiing, literally, as the site of the 2002 Olympic Winter Games men’s and women’s downhill, super G and combined races. For Olympics enthusiasts, the gondolas are each named after an Olympic competitor, which can make the ride to the summit a fun game of name spotting. While there’s plenty of Olympic-level double-black-diamond territory for the brave, for the rest of us, the 3,000 acres of terrain incorporates 106 trails with breakdown of 10% beginner and 60% intermediate runs, with the remainder of 30% designated as advanced trails, covering every level of skier and rider. During my trip out to the Ogden area, the region’s third ski area, Nordic Valley, also known as Wolf Mountain, had called the season early, but this little recreational oasis, renowned for its quaintness and family-friendly atmosphere, along with its legendary night skiing and cross-country ski experiences, is definitely on my list to visit on my next trip to Utah ski country. It’s tiny, with approximately hundred 120 acres of terrain, with just a few chairlifts, but it’s big on heart. It’s also big on accommodating skiers at the intermediate level, with about 50% of its 22 runs designated as blue; but they have plenty of terrain for all levels, with approximately 20 percent of the mountain designed as appropriate for beginners and 20 percent for advanced skill levels. 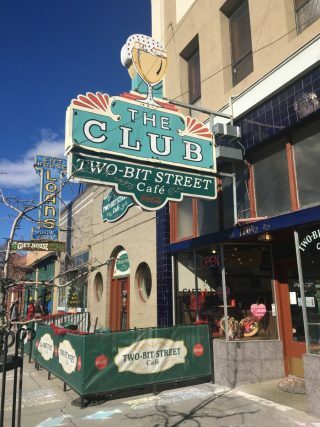 Ogden may seem like a small town, but there’s plenty of après ski options for those who like to come off the mountain and warm up with a cold beer or a cocktail. 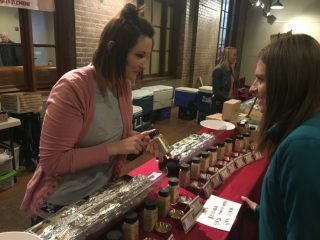 And for those who don’t hit the slopes, there’s lots of other exploits in Ogden, for those with a taste for adventure or just those with taste. 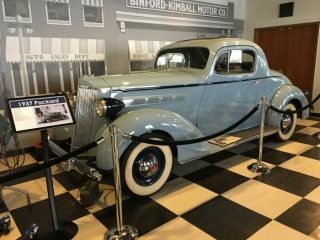 For a quick history tour combined with good food and shopping, there’s the 25th Street strip. The architecture of this artsy area has been well preserved, giving the place the look of an old-style western film set, where one can easily imagine the town’s former gun slinging inhabitants raising a ruckus in the saloons and brothels where now stand fashionable boutiques, restaurants, galleries, bookstores and coffee shops. Our lunch party stopped into Roosters, which we found was all that Yelpers crow about. Housed in the former Eccles Lumber Company building, this bustling brewhouse offers their own home-brewed beer and root beer and features inventive appetizers, like Beehive Cheese Curds, a variety of hearty Mexican entrees, generously portioned salads and stacked sandwiches, along with pizzas and some signature dishes, like Roosters Beer Battered Fish and Chips. 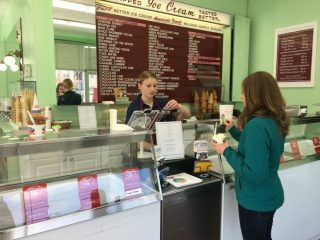 In addition to the flavorsome food, the upper floor offers a great view into the windows of the historic Belle London building, now an ice cream shop, where in Ogden’s early days women of the night tossed beans onto passersby below to get their attention, and maybe their patronage. For authentic Italian, Rovali’s Restorante Italiano on 25th Street offers homemade pastas, a vast drink selection and homemade desserts from their own bakery. 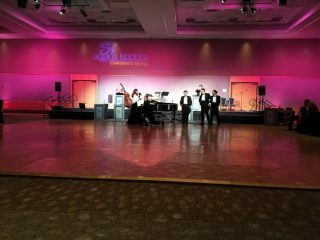 They also feature live music every weekend, with local and national musicians. The 25th Street district is flanked by Union Station, a landmark holdover from the days when Ogden was frequented by railroad carloads of bankers from all over the US, who flocked there for the liberal lending laws, which made Ogden once notable as the city with the most millionaires per capita. 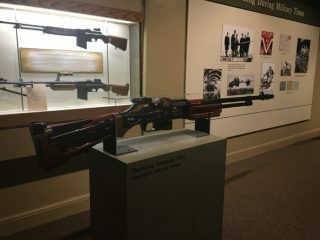 The old train depot now houses four museums, chock full of exhibits commemorating the town’s history as a hub for gun making, trains, cars and cowboys. 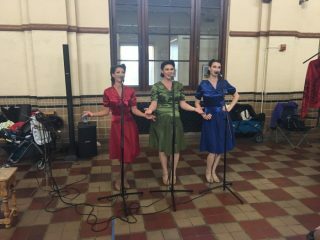 The cavernous hall recently began hosting a winters farmer’s market with local sellers offering crafts, foodstuff, collectables and gift items amid a festive atmosphere with entertainment and art displays. Another notable venue in town is the Eccles Conference Center, a modern and impressive complex that hosts large events, such as a jazz dinner that I attended, where I was served a fabulous steak and lobster dinner that rivaled any five-star restaurant and which was absolutely the best meal I’ve ever had at a convention hall. Ogden’s just the right size town to get around in on foot, if the weather’s decent, or by taking a quick Lyft around to explore its sights. In a small metro area, Ogden is dense with some exciting attractions, all grouped within a radius of a few blocks. The Solomon Center in the middle of town features indoor skydiving at iFly, wave pool surfing at Flowrider, indoor rock climbing at iRock, and an arcade full of activities at Fat Cats, including bowling, billiards and miniature golf. 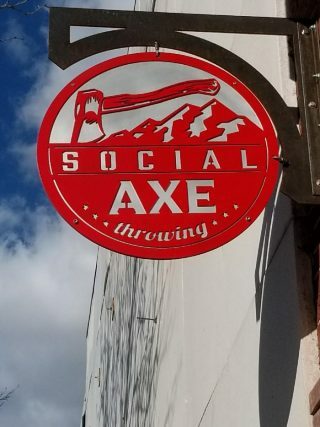 One local attraction that I was thrilled to discover was Social Axe Throwing, which is everything its name promises. 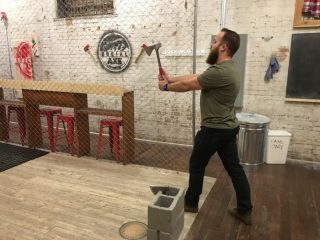 Similar to a bowling alley, but with chain-link cages with a huge target painted on plywood at one end of each lane, this venue offers patrons the opportunity to sling sharp metal hatchets into a wall. 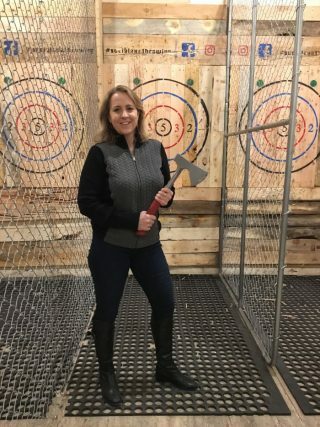 With a short lesson in safety and technique, within minutes I was nailing it with a satisfying slice into the wood bullseye. 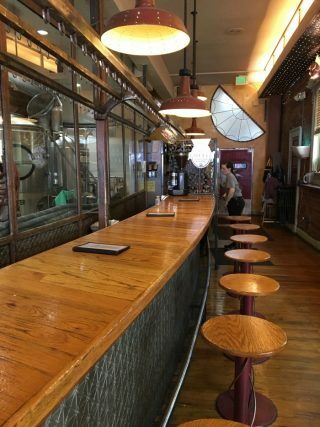 I was intrigued to learn that patrons are permitted to bring their own alcoholic beverages, which they can imbibe behind the saloon doors in the back of the establishment, but because the range resides within 600 feet of a Mormon temple, serving alcohol is prohibited. This got me thinking that maybe it’s just as well that booze is tightly managed when it comes to hurling razor-sharp implements across a room. 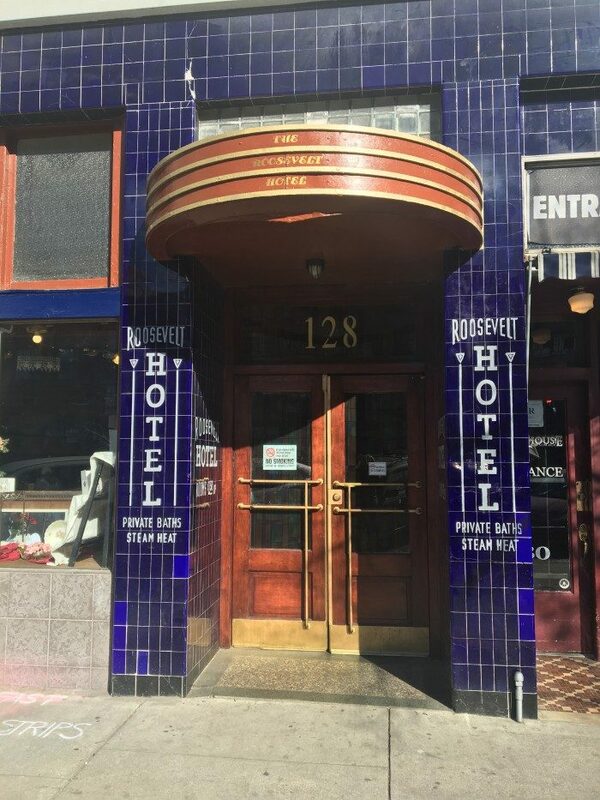 If retail therapy is what gets your adrenaline pumping, there are some adorable independent shops along 25th Street downtown as well as the 85-store Newgate Mall and some big box stores in town. Determined to get a fitting Ogden souvenir, I scouted every outdoors clothing store in town for a flannel shirt when I stumbled upon Recreation Outlet, a mammoth discount outdoor war and gear warehouse. Crammed with surplus goods, including a basement wall-to-wall with boxes brimming with merchandise, on the shelves, tables and floors, this clearinghouse could overwhelm even the most seasoned bargain shopper. Here I finally found a pink plaid women’s flannel shirt, along with a few things I didn’t really need, like four pairs of premium ski socks, a couple face guards, and my best bargain, pliers and a screwdriver for $0.89 apiece. 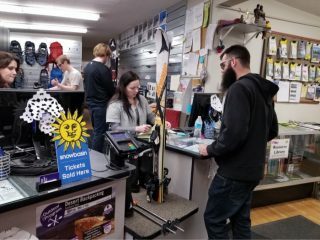 Another find for bargain hunters, particularly those renting ski equipment is the Outdoor Equipment Rental Center at Weber State University. If you can locate the unassuming shed-like building on the college’s campus, you can get great deals on ski gear packages, for as little as $25 a day, or less if you are a student. The staff is friendly and helpful, though you won’t find experienced professionals like you might get at a resort or a sporting goods rental shop; but if you know what you need, you can save some bucks. 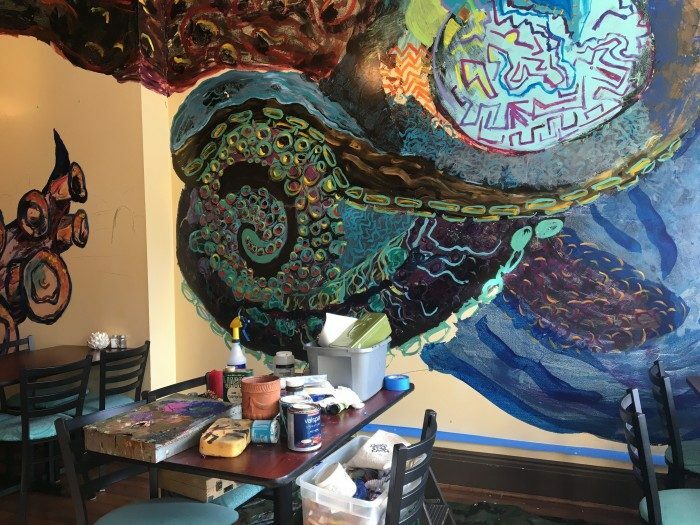 Where to stay in Ogden will not be a decision that takes you long to make, because options are limited, but there is some variety in the handful of inns. 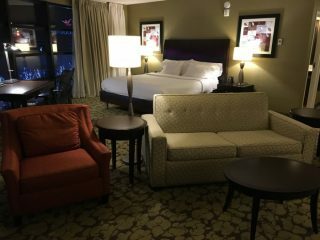 I stayed at the Hilton Garden Inn, in the heart of downtown Ogden, directly across from the Solomon Center. 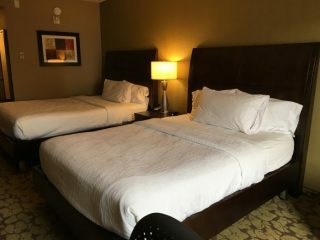 The hotel has all the amenities a short-term traveler needs, and if you book early you might be lucky enough to reserve one of the seven suites with a fireplace and jacuzzi. 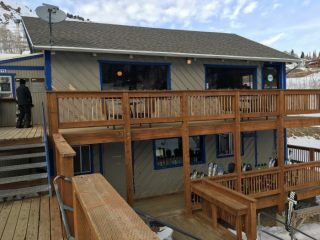 Other options for accommodations include the only luxury property in town, the Bigelow Hotel, as well as many offerings of bed and breakfasts, vacation homes, and when in season, RV parks and campgrounds. 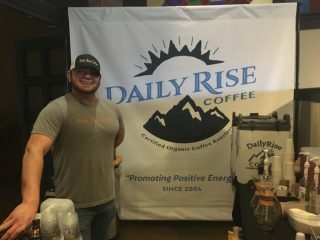 The town once known as a den of gunslingers and card players has evolved over the last century to its current cosmopolitan state, and as someone who had not traveled to the Salt Lake City region in a while, I was amazed to see how much the culture has transformed. The Mormon church still has a strong influence on the area, though unlike many years ago, there are now very few restrictions on alcohol consumption. One leftover of the old days however is that on Sundays most establishments are closed. Our party was fortunate to find Sonora Grill downtown was serving dinner on a Sunday night, or else we might have gone hungry. 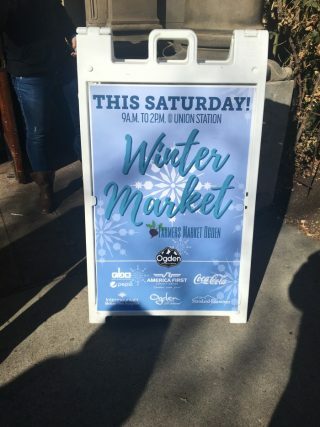 Besides the remnant blue laws, Ogden resembles and feels like any other small town, where the folks are friendly, and visitors are welcomed warmly. By the end of my five-day stint in the town, I knew my way around, and I walked the streets in the evening without a worry. I got on a first-name basis with some of the shopkeepers and hospitality hosts, and even some of their family members. It was no wonder to me that many of the locals told me they had never wandered far from Ogden, nor did they need to or want to. For some the appeal of Ogden is the fresh air, the outdoors attractions, and of course the epic skiing and snowboarding. 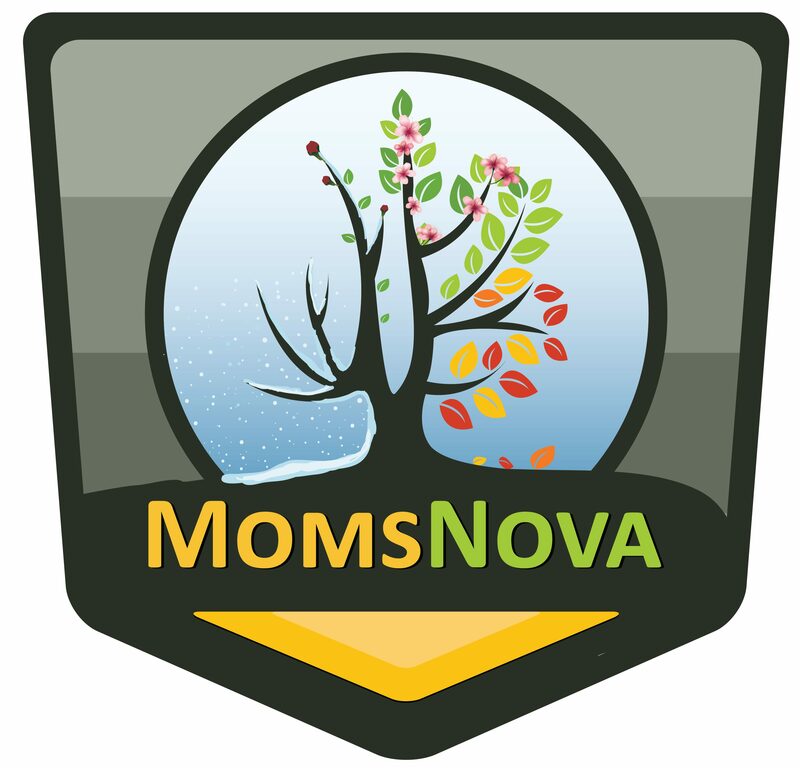 For others, it’s the close-knit community and the low-key, laid-back lifestyle. It’s a place with a lot of history and a lot of progressive changes, yet it’s a place that very much wants to stay the same. 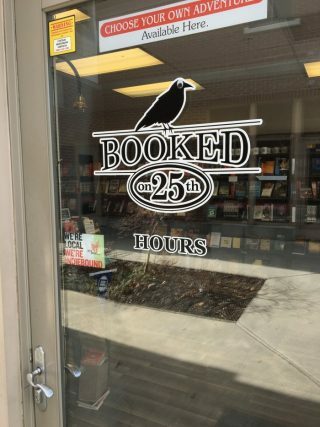 It’s the kind of place where you can leave your front door unlocked and trust thy neighbor, and where the robberies and crimes you read about in Ogden are those in the history books.